BBC sounds music radio podcast from BBC Radio 4 on this show our guests are of such a high calibre the we can manage with just two of them and today. 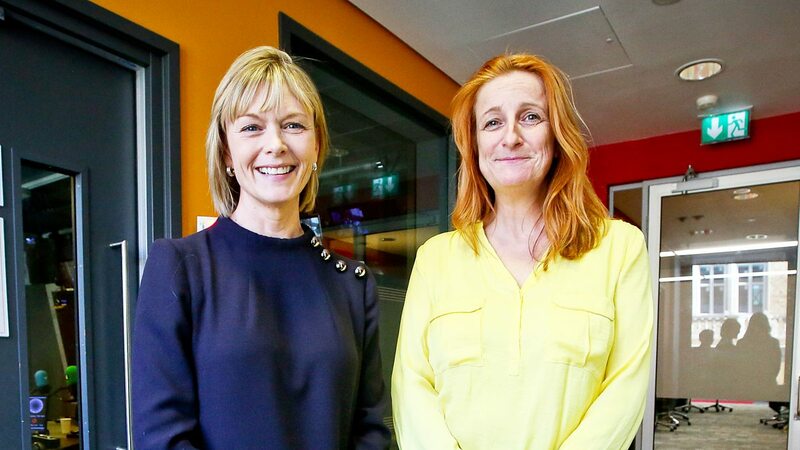 We're joined by a pair of trainers from to National institutions Julie Etchingham is a presenter of ITV News at Ten and Alison Phillips is the editor of The Daily Mirror welcome to you both Alison and congratulations on your win at last week's Society of editors press Awards thank you. See yourself out the way for a reminder changing the law for life as I can pay change Dawn organ donations that people will now opt out of becoming an organ donor list rather than letting it soak and hopefully could save 500 lives a year or presumed consent and then being a newspaper editor most the time. What's the worst thing about your job at the moment. I think the challenge of the job. I think we brexit day and date. That is how we still make it of interest to readers that we make sure they read it. There's no point falling out paper full of news if you're not doing it such a way that it's interesting accessible. I think that's an ongoing challenge. It's constantly a challenge to join the EU new and great journalism with fewer resources that that stuff so but will give a good shot at a magnificent call Frances what you're saying is tight budget limited advertising and her prince at the moment, but it's it's good fun and show ITV I was a bit one moment for your career to play with the listeners that sorted any moment. Can you guess what it would be I've got a feeling it might be something from the Tonight programme how easily 27th how did you know this is from the 2017 general election campaign in addition of tonight? It's still talked about today and it will be for years to come. Josh do you know I'm not quite sure on another nobody is nobody's ever perfect. I mean I have to confess to me and my friends would have used to run through the fields of wheat and Farmer 20 police about that. It's the way she said I have to confess that can really get the Prime Minister said that really did you realise be honest? Did you realise straight away that he was going to be a viral moment. I didn't if I'm really honest and I think it's partly because when you're in the depths of those interviews and and you know this is part of an interview. Where weed weed covered an awful. Lot of policy in manifesto stuff in the snap election so we talked about the so-called dementia tax we talked about free school meals all of this stuff and anything right and this is part of the purpose of the Long form interviews that we do for tonight. Is it actually way there to try to understand the politicians and who they are and what makes them tick and I don't ever to be like you were before you all of your interviews the Alison and Emily would do you know you do a lot of reading you think right? How do we get the heart of this person? And here is a woman who has had a life of Duty she was the vicar's daughter. She was you know in all respects as behaved on the surface of the absolutely perfectly so I just thought what I wonder what the naughtiest thing she had I just I just intrigued by the success when it like that goes viral cause lots of eyeballs on your interview cos this move the chewy stuff about the dementia. Tax is that we were talking really good question because actually you know as a serious news journalism want to you want to get to grips with the policies policies and you want to unpack it particularly if your audience have been directly affected potentially by manifesto pledges, but in the end. It was a question that took his right to the heart of this this woman who fell for many people sometimes can feel rather difficult to read and I have to say that moment you know we had rather a nice exchange with it because I thought I actually thought it was quite hard me. Because it was a moment of complete honesty. She actually was completely unprepared which is often said that tonight was 20 years ago this week and you got am a special anniversary edition on tomorrow. Yes, that's right 7:30 tomorrow evening. What's it about? What we go see really take her when it's a celebration of this program. That has been a part of ITV schedule in primetime the last 20 years and it has got the most extraordinary heritage and of course part of that Heritage is my you know darling friend Sir Trevor McDonald who who anchored it for 10 years and it came on her with some extraordinary programs in a living With Michael Jackson Martin Bashir did you know the interviews with the Lawrence Suspects when it came on there in 1999 and then it sort of shapes and progressed but I think at its core. That's really you know it's grown out of ITV's heartland in the northwest and I think we're broadcasters are always think about how do we get out of London but how come? You make sure that we cover this country properly. This is a program that grew out of the North West of England heartland of and also you started out in regional news from leziate. Do that other programs from Panorama would dispatch is continued as the regional M6 getting out of London well. I think it just has a distinctive flavour to it because it grew out of that Heritage of current affairs from Granada World in Action at the Tonight programme this extraordinary team we have a team that is the vast majority of the tonight programmes has still made by our brilliant team led by Laura Katie Morgan up in Manchester town of the additions of tonight also made by a fantastic team led by Nat Fein are ITN News room and they're very there in our Newsroom for the ITV News so it has the best of both worlds because it's anchored out of London it doesn't feel metropolitan. It's close to its audience. After Emmerdale you know we just sort of know we know our audience and I'm I'm really proud to be able to have been passed that isn't a solid or p.m. But that puts up against EastEnders is not a lot that ITV whenever you prefer it was on at the superpower incredibly well in that slot giving you know where we are. We are capturing an audience who are sitting down for the evening. That's with their family is we getting the best volume figures star audience figures in 10 years released after having 7:30. We provide I think a really great mix at 7:30 sometimes. We're still doing the big traditional interviews sometimes all do a consumer Focus program. I mean I know Kevin lygo sometimes causing the what's in your sandwich programming and then and then we'll have a program that looks at it. We just made a program along the Irish border. And we'll have another program that looked said I'm trying to think of things I've worked on in there. I know if they just the course of last couple of years. We've done everything from divorce to issues around transgender kid and is the host of subject matter is the primary aim of tonight to try and uncover new information to produce grapes groups is it to campaign for social change or is it as with your issues of Tony Blair and someone to apply scrutiny to power? I think her without wishing some unfocused in response. I think it try adding. It does all of those things. I mean we do fast response turnaround programs after the grand for firewood. We did a program straight away that week. We were on the ground for the Paris attacks we were on the ground in our most importantly and inner along with his other normal stories know when the Manchester terror attack happened to you and Ann so we can turn around fast response programs that complement what people are seen on the news. We holds people in power to account with the long form interviews that. Do during the run-up to elections that's a bit of a weirdo it's a bit of all those things we win tonight was born in 1999. So very very different areas giving your intermediate mean. That's a terrible cliches that stupid you know what I mean ITV and all TV audiences were high that you didn't have so much competition from the Internet can current affairs if you're really honest can current affairs programmes have the kind of cut through in the year 2019 that they could in 1999 or do they need that's a viral moments really go to the next level. I think they look at the program and I started watching thinking of doing a little taster of the programs that went out in the early years of the Tonight program. I watch the Michael Jackson pregnant and you can't take your eyes off it mainly because the access to this globalstar was just eye-popping our relation interaction with celebrity for example of changes celebrity. I can't imagine a situation where one might get that sort of access that more. Sing up for the program like that's why is it that you've you've got for your celebrities on that is it because of the growth of the pr industry means that it's just hard to get to that. I think celebrities because they're in control of their own social media for example. They have a direct connection with their audiences. I think the whole PR the control around access is far far trickier but also I think sometimes you know I'm in a Public Service Broadcasting sent there are big issues swirling around at the moment because a lot of political attention is elsewhere there are issues like knife crime when I know these are things that you've looked at to clearly understand you at homelessness at universal credit all these issues that we no matter to our audience and you know it gives it gives space and time for that for us to unpack it and it deserves you can pay them the issue by celebrity. I know you're nothing when we haven't really saying that celebrities are often protector by PIA must be a massive massive problem in the world of tabloids. It's just harder to get the actual inside skinny what's going on a staircase. The harder than it ever was you got there or protect by PR as I think that point as well. They can control their own agendas now by using social media it in the way they would but also I think the public's requirements from Celebrity Juice changed as well go back to that. In 1999 you're probably talking around about the period that HELLO and OK were enormous and celebrities was still regarded with instant high esteem in a way that perhaps they're not now because we've managed to get close them since then we've also had the sudden onset of reality TV where anybody can be a celebrity for a day and Instagram on Instagram so everything will decide if and obviously for the Michael Jackson was an enormous story and it still willing all the story today, but everything's different everything's quicker things faster animal direct when is near la22 size isn't the point in that 20 years ago especially 28 even more PO30 40 years ago celebrities needed journalists to know to get through to the public in the way. No, they don't and they'll do certain things their way and they why would they put themselves out for scrutiny when they can create a very managed image of themselves which they control without any scrutiny exactly list of this about this issue of polarization and trust in a meeting people argue Julie that in a polarized age people are more inclined to watch or listen only two things that they agree with you think that's fair. It doesn't bear out in the good audience figures that we're getting for our mainstream bulletins for example. I mean we've seen you know the best figures for the 10th of February in 10 years and years at 10 as I said also for the Tonight programme real sense of audience engagement and I think actually this is a time for been a trusted news providers like ITN NIC and obviously provides a whole host of a news broadcast from Channel 5 child for an Oscar Isaac ITV News the trusted news content is it you know people are still coming to us and we should feel this is a bit of a moment actually went. Blogging fragmented they there is a place that they can come together for impartial a sum of what's happened during the day and I was doing a Daily News Bulletin they still have to want a newspaper and this that you did mention ITV News a table chef courses York September Time 11 tonight very time consuming it can be a man. I'm very fortunate to have a really nice mix of work. So I do use it 10 for two nights a week. I'm doing tomorrow in Friday as I'm just waiting to see what the latest is this evening obviously and then on the other days. I might be going tonight. I might be working on exposure for example which is also past the ITV current affairs what you're going to be worse, It's about this time for your 443. We can mention me more about 5 p.m.
Saturday and the stats show that a large percentage of us are in under 10 and that the older age brackets and some pulses would argue that makes them more likely to be leave Otis in the EU referendum. How do you try to reflect that in your coverage of brexit are GTS to be impartial and that is you know the overriding duty for broadcast journalists in this country, so we provide impartial take and what has happened on the day and what do you do the Channel 4 news on BBC 10 news? Don't do what's the what's the signature editorial approach? And I think I think actually we know we clearly covering very similar stories. Lot of the type of ticket at the top end of the News Bulletin I think the thing that we have a very small family of experts and Correspondents and certainly something that Tom bradby. Is is very keen on and I am 2 is that you know we've got this trusted and well-known handful but more than a handful clearly cos we got we coming a whole range of stuff up trusted lineup of faces. We've got our national allegra Stratton we got amazing arts editor Nina nannar, and he's he know we actually name check them. Family that we bring to the table to win the relay. I think it's that relationship with our audience that we try has a relation with authority voices cos when when Kevin lygo Spotify TV and white fanfare kind of relaunch News at Ten few years ago. There is there in the hole. Where the nightly show came on and their scheduling was all over as you're so you're smoking at this point as a decimal reasoning for money at the mention the nightly show with it because it's trapped in your back on at 10. You know that that was that was a top time for News at Ten it would be ridiculous of me to say otherwise Australian back every bit of how you hide Robert Peston there's a big attempt to put some more personality into the news you mention. You've got them record audience figures that hasn't shift at the door so much that you say you're all this piece of Dumbledore it's really chipped away at the rivals elsewhere. How would you assess? How that real or just gone? Creating it happen when we brought back News at Ten ten years ago because that's the point at which I I was very fortunate to join Sir Trevor when he was brought back to do it and then and Tom came into the program a few years ago and I think it has its it has a different identity at single headed broadcast immediately have a different identity because you have a different relationship out with your audience at Thomas got a very relaxed conversational style in the way he anchors the program and and I have my own way of doing it as well. You know we work very closely we have an extraordinary right on News at Ten David Stanley who was charted the whole history of News at Ten and work tonight and we work extremely closely to make sure that our voices are sort of come through it without imposing of you on it. I like they're giving us where people applied cos anybody got an amazing team and I know it's one of those things that you're very keen on actually and you know we have an incredible team of producers and correspondence as I mentioned the word, how did mirror voters vote when? We're about 5050 hours, so we are Julie's got a duty to be impartial you don't but you've got a split readership. How does that affect how you can we have it was very difficult in the run-up to referendum because we knew a lot of hours. We're gonna vote to leave and we understood a lot of the reasons why they felt that way but as it came close the referendum day. We felt we also had a duty to come out and say what we felt was the best thing for our readers may do so we came out saying to remain but we did it very much for the context of understanding why people might vote leave because I think a lot of the problem around that hold. Is nobody's gave credit to what people were feeling when they made the decisions. They were making and so since then we have tried to reflect how people on both sides fill liquid kind of a quite a similar player is the Labour Party in that a lot of our readers are old labour there in those former manufacturing towns of Lords of a lot lot of our readership heart. Is in the northwest and they were people who were very angry about Harry been treated particularly angry after years of austerity and felt that their their feelings with being kind of misunderstood and blotted out by the Liberal elite, that was much talk about the time but we also felt that a lot of our readers who voted to leave but there was still extraordinary social conscience is still in very tolerant of other people but just got to that point where they wanted change in this was their way of calling for it. So so since then we've with everything. We've done with really tried to keep that at the forefront of their minds and would have brought to for sales that good good. Not been bad actually very my how much we splashed on politics over the last few years which five six seven eight years ago. They thought would be after disastrous for a tablet keep doing on an irregular periods by the four quite know what's going to happen. If I think it will do keep coming back for the next installment. Don't got two wonderful names call Thomas Breen a lovely people they retired now went away for 10 weeks came back and they said you know the about brexit's you come back after 10 weeks and it's exactly the same and he should see me. This is serious question what you do when you know Jones miso perishable me. How do you cover breaks it in a meaningful way, when is going to be overtaken by venture than 24 hours because I think it's all about explaining it. So what area is want all the time is what does it actually mean so there's some new statement from from the EU or from Theresa May and I want to know what does that actually mean so we will do a Q&A everyday we were due analysis everyday, so it's explain what it means to the readers and how it might payouts next I do believe although you could say on the top line is that nothing's really changed over. He was a lot during that period lots of happen and this comparison and the other week that it's a bit like if you were watching a Dallas would have of the early 90s when you thought God has been on for ages years and years and years if he's never going to end and then and then Bobby Parr comes out the shower. I think that's the kind of follow the twists and Turns in a way that we never really thought they would but you say that with us or sending element of hope. I know Shazam we mention other campaigns at the mirrors done notorious campaigns over century great. Hue colour when your famous editors in the mid-20th century is defined by shoes campaigns based on their moral significance or on your chances of winning on how much it shows empathy I just care about you never launch campaign you did that you can yes, I would yes, would you yes they were you launched? What was you not tell you what not have done. Cos it was just so it high street. That is a real point of anxiety. A really solid depressing effect on their everyday life if they walk to the shop and then all the shops. I used to like of all closed down there turn into Talent tanning salons now. We aren't going to change certainly single-handedly the shape of the British High streets. Can you can't know but we can did you can do an awful lot of stories about how Amazon app how to pay my tax bill to be and we can do a lot of stories about things like rent about parking about all these issues that add up to this problem that we can have a little successes along the way and we have done but more than anything. We can show the readers we care about what you care about and we're going to do a little bit to help your own this weather in the studio and there's nobody vacation take they pay with a text at then it meant to tell you that they are legally required to act in his Diaries when your princess is Piers Morgan writes about the Ferocious rivalry, and this is sort of late 90s between you guys in the sun. Do you ever wonder over to your news desk in the morning and say to a news editor? Why the hell is that store in the sun and not in oz? Lycee ozenne the I paid for the somewhere that when they get that from how's that come about having is always important to understand so and I think it's really important to keep up those journalistic standards, but I don't think she ever become so obsessed by it to the you judge your own papers standard on somebody else's decisions. I read a very different to the sun's readers and we don't want to do something else by the Satanic Cemetery to say yes. We do but you don't necessarily do that by having the same stories as then I think you do that by having an overall environment and sort of sense of belonging that allows mirror readers have that I think they may wish to join a few years ago you loads of paper for your company now rename reach PLC your postcode new day if after a couple of months. The real community amongst the readers such like that happen till that point I hadn't really experienced before how how you did that and the interaction which I think we learnt a lot about how a digital world was working and how you could bring elements of that back into print which we now trying to do with the mirror and I think more than there was also a thing about that paper which was focusing on optimism as part of the package that that's not go down the line of doing all good news stories, but there is no doubt that. I think readers particularly now want a sense of solution within story, so it's not just waiting about the problems that it suggested a survey to try things even if they're commercial without I think the entire company as a good thing to do because good things to do in much about that. We failed because it's a novelist to be prepared to take more risks exactly I want to talk about something you started your career. Pages my love this so why I was interested in your dad who knows maybe again one day and it's coming home and campaign and he has to work on Thursday at the end of a shift walkthrough the trainer pick up every newspaper and a particular be used to work a lot of 12-hour shifts every Sunday as he was coming home at sunrise at 8 at night and he's bag which I can I can I can still smell the back because I think Chris Melia in those those papers Melia and we'll have that we would have everything from these wild raichu the Sunday Times and I would have them all laid out and I just thought this was most Magical Mystery event ever I think from there was born that sort of interesting and even quite a young age. I can be getting local newspapers then cutting out stories and then stick with a minute if you think with your back. No, I don't really think that's bad. I think in the mirror and we've got quite a lot of people like me. I think elsewhere other print brokers countries to push. I think it probably is Julie you went to a comprehensive in Leicester from here to Cambridge what do you think is the biggest obstacle for young Chinese today, St gender or class really great question about 4 minutes ago. So I think you could you could analyse each of those but I do think that class is perhaps the one that hasn't been gone to grips with understood because it is about I think it. Complete outside not seem like an outsider when there's a lot of very confident very confident people in the media who may have benefited from having a primary discussing the show before the extremely interesting work academical Sam Friedman the medicis research and work with the class ceiling as shown the importance of connections wealthy parents finding the right mentor response out the ladder and Importance of Being in in London why is the media in this country in the year 2019 so dominated by a metropolitan middle class instability because there hasn't been enough of that work done and there hasn't been enough outreach done by newsrooms. I know are ITV News taken 3 series 6 of breaking into new scheme to try and engaged at a younger earlier level to say get in here Telugu stories find a way of telling stories and engage with us. I know the John Schofield trust which does so much amazing mentoring work in the media is looking at this really specifically but it I just think that you make are news programs relevant to the audiences that we serve. We have an absolute duty to make sure we get out there and just don't take the dirham in as an amazing time. I'm not under the I don't wanna undermined the talent whichever background. It's come from in our Newsroom but it's sometimes you have to be proactive and that means getting out into schools. Not necessarily universities and saying hey you know if you're nosey person like I was at school and just wanted to just here or is it just getting you know just being nosey and get on with it. There's a way into it and don't be put off by the fact that there's some very slick confident people in this business and got a clue what they're talking about me local newspapers used to be a very reliable route for working class people into big jobs weather in London or Manchester or other big cities. What do you think we can do to address the temp what you might call the demographic deficit in media? Yes, what I mean so reach their own zones the mirror and recent papers across the country to be true to me. Yes and so we have a trainee program. We take trainees in and from those Communities as a real in this now on recruitment. For from the community that working out papers so internally we have got ways of bringing people up, but I think this is a problem across the whole of society and my theories were actually going backwards in this area in that. I think kind of when I was young it didn't really hurt me not to do whatever I wanted to do because I would never know where is now. I just feel there is far more obstacles and if anything that the media and other Industries are closing their doors because I think write these people are in velen anymore in depressing. They always do it this otherwise Shearing the Cognitive and illuminating show Qashqai just feeling really good are well, and that is all we have time for Tadley thanks at Julie Etchingham allowance if you're both very much do becoming is really really good to talk to you tonight is on tomorrow. If that makes sense when I see view it was 7:30 3730 and the mirror is always available don't forget to find out podcast in the BBC sounds.